TThere is a question mark over the future of the facade of the former Garstang Business and Community Centre after its new owners raised safety concerns over its future stability. 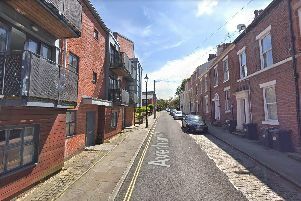 Keyworker Homes has recently applied for planning permission to deconstruct and later reconstruct the front of the landmark red brick building at the top of the High Street. Permission was previously gained to convert the property into flats and build a retail area on the site adjoining the High Street car park. Planning approval was granted in 2016 with proposals for a new three storey building and partial demolition of the existing building, with the proviso the facade was retained. Keyworker Homes completed purchase of the site on December 21 and has put in the new application to former owners Wyre Borough Council detailing health, safety and technical concerns.